Without giving you any theoretical answer we will show you some numbers that will suggest what is right time to invest in stock market. Let us take you through the story of three friends and their different investing styles. Each invested Rs 1,000 per month starting 1st August 2002 and till 31st July 2012. The only difference was in the way each one of them invested. The first – let’s call him Mr. Lucky – was indeed very lucky, and he was able to invest his Rs 1,000 into the market at the lowest level of the Sensex every month. Then, the second – Mr. Unlucky – was so unlucky that he invested his Rs 1,000 at the highest level of Sensex during that month. The third friend – Mr. Wise – took a simple, consistent approach. What he did was invest Rs 1,000 on the first day of each month. The result is very clear Investing wisely paid off. In other words, Mr. Wise – who was neither too lucky nor too unlucky – earned the second best returns of the lot. The best part is that Mr. 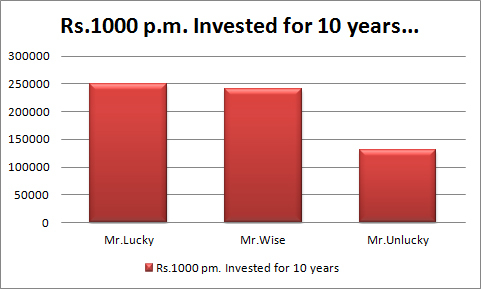 Wise earned just 4% lesser than Mr. Lucky (and you can never be that lucky!) and all due to his discipline of investing his money at the start of every month – without trying to time the market. You’re getting the point, right or not? 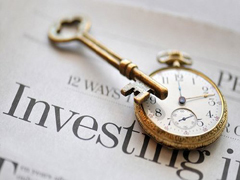 See, it doesn’t pay to look for the “right” time to invest unless you have this marvellous knowledge that you are going to be very lucky with your investments. The best course of action for most of us as it comes out from the above results is to create an appropriate plan and take action on that plan as soon as possible. Realistically, the best action you as a long-term investor can take is to invest in a systematic, disciplined way, regardless of the level of the stock market. We come across certain people who do not invest in stock market, as they are fearful in investing in stock market, but believe me return on investment is one part but if you really want to be wealthy than you must invest in stock market. Example of wealthiest person who has become wealthy by stock market is Greatest Stock market investor and Investment Guru Warren Buffet holding stock around 74 Billion $. So, stock market investment is must & there is nothing like right time to invest in stock market you must invest systematically & disciplined manner to get rich return from stock market. « Gold bullishness will last in future!